If I could give this book more than 5 stars I would. As always Susin writes wonderfully flawed characters in an honest and non judgmental way while tackling serious issues. Her ability to balance the heartbreaking with the uplifting never ceases to amaze me. I am always so thankful for the books she writes. Meet Felix. He's a 12 year old who loves trivia, French, and most of all his mom ( who insits he call her Astrid). Unfortunately they're currently homeless. He does everything he can to keep his head up and live his best life. Wow! Susin Nielsen packs a lot into her books and No Fixed Address is no exception. Felix was a wonderful character. He was smart, real, kind, caring and incredibly moral. The fact that he actually wanted learn was really unique! Most of the time kids are portrayed as those who hate to learn and that is sad. His heart of gold warmed mine, especially when he took care of Astrid. Astrid and Felix had an incredible bond. Even though they were odds with each other sometimes you could really tell that they loved each other. I also loved that she didn't hold a lot back from Felix and treated him like a real human being. Conventional mother of the year, Astrid was not. She was deeply flawed and did some slightly unethical things. You could tell she absolutely loved Felix though because she did those things for him and tried to give him the best life she possibly could. They were incredibly deep characters. Every time that you thought you had discovered the last layer of them Susin Nielsen added a new layer to their character. I also loved Felix's best friends Dylan and Winnie. They kind of gave me Hermione and Ron vibes. 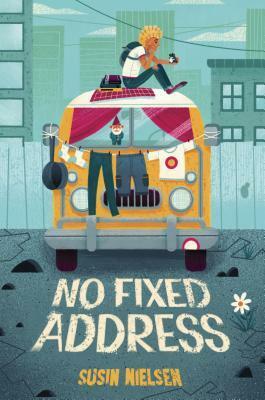 No Fixed Address was it largely character-driven story, that really touched on some hard to discuss issues. It did this remarkably well all while keeping a light tone about itself. By pure happenstance of library availability, I read Just Under the Clouds and No Fixed Address back-to-back. Although both books cover the topic of homelessness, feature protagonists of similar age, and are considered middle-grade (I'll get back to that point), they are vastly different stories. Address confronts the issue; Clouds obfuscates. Dear George Clooney: Please Marry My Mom introduced me to Susin Nielsen's sharp, quirky characters and witty narrative voice. There is no exception with F By pure happenstance of library availability, I read Just Under the Clouds and No Fixed Address back-to-back. Although both books cover the topic of homelessness, feature protagonists of similar age, and are considered middle-grade (I'll get back to that point), they are vastly different stories. Address confronts the issue; Clouds obfuscates. Dear George Clooney: Please Marry My Mom introduced me to Susin Nielsen's sharp, quirky characters and witty narrative voice. There is no exception with Felix and Co. in her newest novel. Yet I am most impressed with the creation of his mom, Astrid--her pride, her depression, her history, all thoughtfully motivated. In a way, she is the antagonist, and she is still vulnerable. Also thoughtfully crafted was the label Felix and Astrid gain: "hidden homeless." Those with intermittent roofs over their head, with no real address. From personal experience, I can attest to the desperation and shame that comes with such displacement. No one decides to one day walk away from a home; it's stripped from them gradually, due to loss of work or sudden medical bills, or other dire, often unforeseen circumstances. Nielsen didn't shy from including the bleak details of homeless living, but retained humor and heart throughout. This is the first book by Susin Nielsen I have read and it will not be the last! This book tackles the topic of homelessness, a parent barely able to take care of herself, and her son who holds it together during really tough times. Felix is a great character...vulnerable, intelligent, and resourceful. But reading from the perspective of a homeless child made me really think about this issue. Great book for a classroom library and a book group because you want to talk after finishing this one! I spent a good deal reading this book angry at the mother. Then I realized that I had no way to empathize with her, no way to understand that some have so much heartbreak in their lives that it plays out in their choices even as a parent. But this is really about the parent Astrid's son, twelve-year-old Felix Knutsson. Underlying the story is Felix's knack for trivia. His favorite game show is Who What Where When; he even named his gerbil after the host. Felix’s mom, Astrid, is loving but cannot I spent a good deal reading this book angry at the mother. Then I realized that I had no way to empathize with her, no way to understand that some have so much heartbreak in their lives that it plays out in their choices even as a parent. But this is really about the parent Astrid's son, twelve-year-old Felix Knutsson. Underlying the story is Felix's knack for trivia. His favorite game show is Who What Where When; he even named his gerbil after the host. Felix’s mom, Astrid, is loving but cannot hold on to a job. Her "knack" appears to be words that alienate. She has a bitter tongue that will not stop. When they are evicted from their latest shabby apartment, they have to move into a van. Astrid swears him to secrecy; he can’t tell anyone about their living arrangement, not even Dylan and Winnie, his best friends at his new school. If he does, she warns him, he’ll be taken away from her and put in foster care. Life for these two does not improve, then Felix gets a chance to audition for a junior edition of Who What Where When, and he’s hopeful when he is accepted. The time surrounding these days are harrowing. I couldn't stop turning the pages, wishing someone would help. I felt it wasn't a twelve-year-olds' responsibility to save the family. He thought winning the cash prize could make everything okay again. But things don’t turn out the way he expects. . . . I loved this boy, so full of what are the right things to do, sometimes helpless to change his mother, but continuing to make his own life right while caring for her, too. Nielson writes about the important subjects of hidden homelessness, depression and poverty in a powerfully authentic and funny way. I adored Felix. His wit, kindness, humour and nerdiness are utterly charming, and the loyalty he has for his mother is as beautiful as it is heartbreaking. A truly important story about hidden homelessness, beautifully told. I absolutely loved this novel. My thanks to NetGalley and Penguin Random House UK Children’s Publishers for a review copy of this one. This was such a wonderful wonderful read for me—heart-breaking, and cute, and making me smile a little all at the same time. The story is told in the voice of twelve-and-three-quarters-year-old Felix Knutsson, who lives with his single mother, Astrid (she insists he calls her by name) in a Westfalia van. They have seen a change in fortunes from a time when they were doing ok and had a home, to My thanks to NetGalley and Penguin Random House UK Children’s Publishers for a review copy of this one. This was such a wonderful wonderful read for me—heart-breaking, and cute, and making me smile a little all at the same time. The story is told in the voice of twelve-and-three-quarters-year-old Felix Knutsson, who lives with his single mother, Astrid (she insists he calls her by name) in a Westfalia van. They have seen a change in fortunes from a time when they were doing ok and had a home, to one where Astrid is more or less jobless, and almost penniless, and have to take the only option available to them, of living in a van. Felix had had to change schools and homes many times over the years as they moved around various parts of Vancouver but finds himself now back in school with one of the only friends he ever had, Dylan Brinkerhoff. Before long Winnie Wu, somewhat Hermione-Granger-like, and a bit over-enthusiastic about school joins their little group. But Felix has to navigate through all of this without ever letting slip his living arrangements as both Felix and his mother are terrified of falling into the ‘clutches’ of the Ministry of Children and Family Development, which they are convinced will place him in foster care, and apart from his mother. Alongside, he must also deal with his mother, who isn’t exactly a bad mother but not a particularly good one either, with many facets to her character (specifics might be a spoiler), that are far from perfect. His only hope lies in participating in his favourite game show Who, What, Where, When, which is having a junior edition, through which he might win some prize money that can help tide them over. Susin Nielsen - Susin got her start feeding cast and crew on the popular television series, Degrassi Junior High. They hated her food, but they saw a spark in her writing. Nielsen went on to pen sixteen episodes of the hit TV show. Since then, Nielsen has written for over 20 Canadian TV series. Her first young adult novel, Word Nerd, was published in 2008 to critical acclaim. It won multiple Young Readers Choice Awards, as did her second novel, Dear George Clooney: Please Marry My Mom. Her third novel, The Reluctant Journal of Henry K. Larsen, was published in August 2012. It went on to win the Governor Generals Literary Award, the Ruth and Sylvia Schwartz Award, the Canadian Library Associations Childrens Book of the Year Award, and a number of Young Readers Choice Awards. Author Wally Lamb named it his top YA pick for 2012 in his First Annual Wally Awards, and recently Rolling Stone magazine put it at #27 in their list of Top 40 Best YA Novels. Her books have been translated into multiple languages. Susins new novel, We Are All Made of Molecules, will be published in Canada, the US and the UK in Spring of 2015. She lives in Vancouver with her family and two naughty cats. She is delighted to have finally figure out how to "claim" her author profile on Goodreads!